2006 Alan Fortunoff Humanitarian award - Long Island International Film Festival. for institutional, academic, library or wholesale prices. 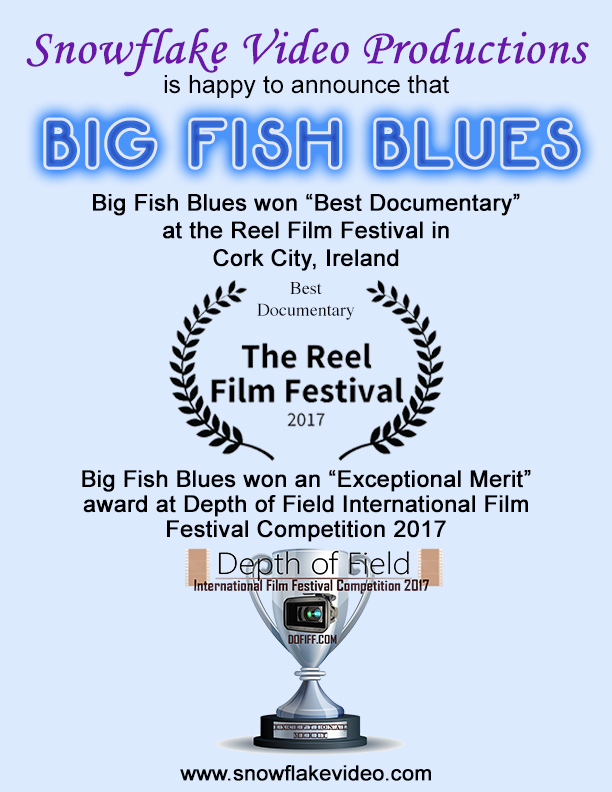 Big Fish Blues: The Big Fish Blues documentary chronicles the performances and stories from several internationally known Long Island blues musicians and reveals a genre and a host of incredible performances by these blues greats. Nyla Helper: Lakota Medicine Woman, Mato Wiyan (Bear Woman), is a traditional Lakota Spiritual Woman of the Hunkpapas Band. She is a member of the Pine Ridge Indian Reservation (Lakota Sioux) in South Dakota with her husband, a Lakota Spiritual Leader and Head Man, David Swallow. Nyla speaks about the life she lived and the trials she overcame that made her into the respected medicine woman she is today. Join Hands: The Life & Art of Matt Sesow profiles the journey of Matt Sesow, who just six years after losing his hand as a child in an accident in which a crashed plane severed his arm and took away his dominant hand, Sesow played for the US team in the disabled Olympics in England. While working at IBM as a software engineer, he began painting scenes in oils that were influenced by his traumatic injury. Buffalo Nation: The Children Are Crying focuses on the devastation in which the children of the Lakota Sioux Nation are forced to live. The children are filled with despair and are committing suicide at an alarming rate. They are crying for help! RUSSELL MEANS LAKOTA WARRIOR is an exclusive interview with Russell Means at age 70+ years at his home in Porcupine South Dakota, on the Pine Ridge Indian reservation. RAW VISIONS (Art of Survival) is a documentary based on the Survivors Art Foundation mission of healing through art. This compelling movie exhibits the artists' creativity by exposing their most profound inner visions and truth. In her thought-provoking paper, EXPERIENCING AGING, Catherine Papell, social worker extraordinaire, reflects on the process of aging, observing her own personal journey as a lens through which she focuses her unique wisdom. AKA Long Island Rock and Lapidary shop was a fixture in the town of Bellmore, N. Y. for 48 years. People came from all over to view the collections, as well as to seek advice about gem stones and healing. Mark Morgan and Rosalyn Anker were the beloved charismatic owners. This exciting new documentray offers an intimate portrait of the Cajuns of Louisiana & the centuries old legacy that both defines and inspires their lives among the moss draped cypress recesses of the Atchafalaya basin. On August 29 Hurricane Katrina swept ashore on the Louisiana coast. Among those communities devastated by her impact were the smaller Houma Indian settlements in lower Plaquemines, lower St. Bernard, and lower Jefferson parishes. Jumbelaya, Zydeco, Gumbo: exotic sounds from the beloved culture of southern Louisiana. Join the Cajun people, who let us into their lives and share their good times. Puts you behind the scenes so you can share the excitement and exhilaration of the world of show dogs! In Senegal and almost all West Africa, illnesses are considered to be the result of supernatural aggression. The N'DEUP Healing Ceremony enlists the community under the direction of the N'deupkot. Drums, dance remedies and bloodletting are employed in the effort to appease the agitated spirit. We closely share the rigors 'n romance of the road as we encounter some of the nation's most breathtaking roadside scenery and heartwarming truckstop characters. Be well prepared to have your heart stolen by this reefer-jockey and all the folks you'll bump into on this wild and rollicking road trip! A documentary that both alerts the world to the continuing injustice in Tibet and reveals the heroic endurance of the Tibetan spirit. The premier showcase of America's bounty... The IOWA STATE FAIR! We go behind the scenes to discover the secrets behind the bovine beauty and piggy pulchritude that inevitably graces the dinner tables all over the United States as well as the rest of this hungry world. We twist, turn lurch and learn in this exciting and eye-opening tour of mesmerizing Jaipur, India that legendary "Pink City". Behind the fabled pink walls of the ancient city of jaipur, India, the cutting of semiprecious gemstones has been a way of life for centuries. Venture inside the factory for a demonstration of the lore and artistry behind this time-honored craft.